Joan Derrah, a lesbian who kept her sexual orientation to herself during her Naval career, recalls how the "don't ask, don't tell" policy led to a rise in interest regarding homosexuality among the ranks. It was 15 years ago, Tuesday, that President Clinton rolled out the policy that came to be known as "Don't Ask, Don't Tell," which relaxed the long-standing bar against gay men and women serving in the U.S. military. While the move was initially hailed as progress for the rights of gays in the military, today many see it as a liability. 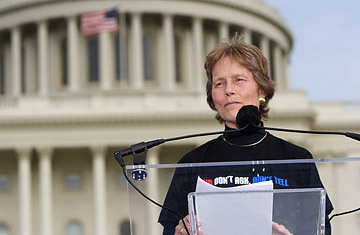 Her Navy career had been "relatively stress-free" before "Don't Ask, Don't Tell" took effect, says Joan Darrah, a retired captain, and a lesbian, who served in various intelligence billets from 1972 to 2002. She kept her sexual orientation secret during her career, but that denial took its toll after "Don't Ask, Don't Tell" led to increased focus on homosexuality in the ranks. She recalls having to administer a survey on the topic to 250 subordinates in the wake of the new policy. "We all sat down taking this survey asking, 'Do you know a gay person, and, if you did, what would you do?' " Dannah recalls. "I was physically sick after I did it  I went into the bathroom and threw up because of the stress of standing in front of the command and saying, 'We're now doing a survey about gays in the military.' "
The issue exploded during Clinton's first week as President, triggered by those in the Pentagon and on Capitol Hill opposed to his campaign pledge to reverse an executive order barring gays and lesbians from serving. "The issue is whether men and women who can and have served with real distinction should be excluded from military service solely on the basis of their status," Clinton said at the time. "And I believe they should not." While the phrase "don't ask, don't tell" wasn't used at that January 29, 1993, press conference, that's what everyone soon began calling the policy. It boiled down to this: the government would no longer "ask" recruits if they were gay, and so long as military personnel didn't "tell" anyone of their sexual preference  and didn't engage in homosexual acts  they were free to serve. But, by the end of 1993, opponents of the change, led by Georgia Democrat Sam Nunn, who chaired the Senate Armed Services Committee, succeeded in writing into law the ban on openly gay men and lesbians in uniform. Barring the pre-enlistment question about homosexuality "was the only compromise Congress let Clinton get away with," says Elaine Donnelly, president of the non-profit Center for Military Readiness which supports continuing the ban. "The law respects the power of sexuality and the normal human desire for modesty in sexual matters." Writing "Don't Ask, Don't Tell" into law meant that no new President can eliminate the ban without first convincing a majority of Congress to go along  a far higher hurdle than Clinton faced. All the Democratic candidates favor lifting the ban; the G.O.P. candidates support keeping it. "I think President Clinton meant well, but when he set out to implement his vision he ran into a buzz saw," says Aubrey Sarvis, an ex-GI and executive director of the Servicemembers Legal Defense Network, a nonprofit group dedicating to lifting the ban. "I see very few, if any, good things about 'Don't Ask, Don't Tell'  it means you have to lie or deceive every day." About 12,000 service members have been booted from the military since the law took effect, including dozens of Arabic speakers whose skills are particularly prized by the military since the advent of the war on terror. While the number discharged for their sexuality has fallen from 1,273 in 2001 to 612 in 2006, Pentagon officials insist they are applying the law as fairly as ever. Gay-rights advocates disagree, suggesting the military  pressed for personnel amid an unpopular war  is willing to ignore sexual orientation when recruiting becomes more difficult. Last May, a CNN poll found that 79 percent of Americans feel that homosexuals should be allowed to serve in the military. But Americans in the military seem less friendly to the idea of junking the ban. A 2006 opinion poll by the independent Military Times newspapers showed that only 30% of those surveyed think openly gay people should serve, while 59% are opposed. "I don't think they'll succeed, but I think they'll try," Donnelly says of the Democrats' efforts to repeal the ban. Darrah, the retired Navy officer, says success depends on who moves into the Oval Office a year from now. "I believe if we get a Democratic President we'll get rid of the ban," says Darrah, who is backing Hillary Clinton's bid for the White House. "The younger generation doesn't care one bit."